Organise your days and weeks with this spiral bound hardback planner and notebook featuring our newest Ditsy Meadow print. There are 5 tabbed sections for all your plans, dates and notes. Notes to Self is a list making section with ruled pages, the notebook section with 140 ruled pages makes it great for jotting down ideas. The sketch book tab has 30 plain paper pages for drawing and the final tab a squared paper section for planning or list making. There is an inner pocket to keep hold of your tickets or receipts and the contrasting elasticated closure keeps everything inside. 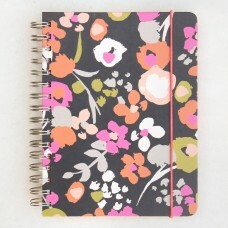 Inspired by the huge planner trend this Ditsy print organiser is the ultimate stationery item to keep life on track.